Attending both Friday and Saturday and is NOT a WCAPN member. Attending ONLY Friday and is NOT a WCAPN member. Attending ONLY Saturday and is NOT a WCAPN member. An additional 1.25 contact hours will be issued. Attending Friday and Saturday and is of student status. Attending ONLY Saturday and is of student status. Attending ONLY Friday and is of student status. Attending both Friday and Saturday and are a WCAPN member. Attending ONLY Friday and is a WCAPN member. Attending ONLY Saturday and is a WCAPN member. *This WCAPN fundraiser includes wine, light appetizers, a 16" x 24" canvas for you to take home, and paint supplies to complete your painting. This session is limited to the first 24 people. Onsite Registration is still available. Click HERE to print a registration form to complete and bring with you onsite. 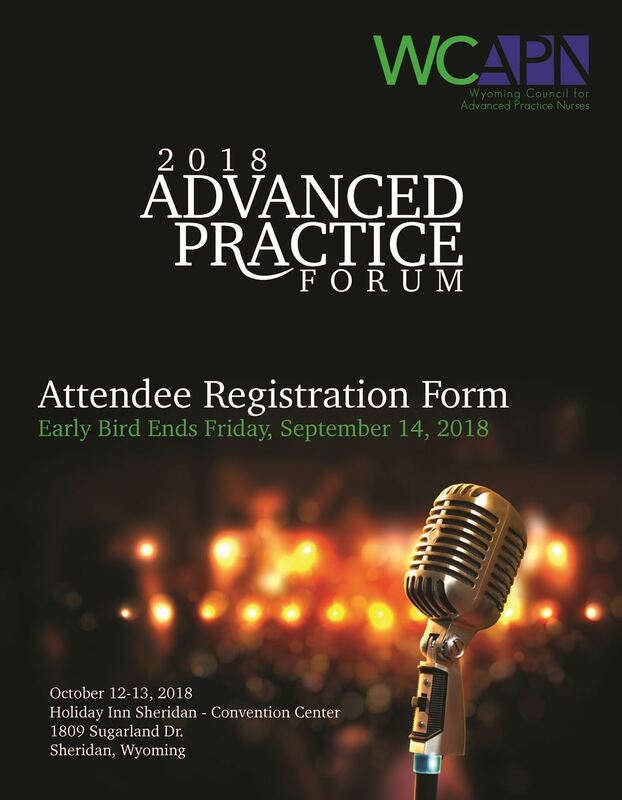 The Advanced Practice Forum, will be held, October 12-13, 2018 at the Holiday Inn Sheridan - Convention Center | Sheridan, Wyoming. Please click HERE to see the full agenda. You can also click on image below to view the agenda.